Mr. Walter A. Macht, P.E. Thank you for your letter of March 28, regarding the application of the Occupational Safety and Health Administration's (OSHA) Hazard Communication Standard (HCS), 29 CFR 1910.1200, to chemicals used in humidification systems in office areas. This letter is also in follow-up to the discussion held between you and Ms. Melody Sands of my staff on this same topic on April 26. You attached to your letter a copy of an article from the March/April, 1990, issue of a trade journal entitled Engineered Systems which claimed that OSHA's HCS required employers to do such tasks as retain a legal firm, contract with environmental consulting engineers to "make" an environmental impact study of humidification systems which are "chemically dependent," submit a plan for OSHA approval, and several other items. These efforts are not required under the HCS. I am enclosing for your information a recently-revised booklet on the HCS entitled "Chemical Hazard Communication," along with a copy of the standard itself and OSHA's compliance directive for the HCS, CPL 2-2.38C, which will help clarify the misconceptions set forth in the trade journal article and provide information on employer responsibilities under the HCS. Your specific question concerned whether the HCS applies to office workers who may be exposed to trace amounts of chemicals emitted from steam humidification systems which are part of the overall heating, cooling and ventilation system of the building. As discussed with you on the telephone, the requirements of the HCS would apply to employers of personnel such as maintenance workers, building engineers, or any other employees who would be exposed or potentially exposed by handling or storing the anti- corrosive chemicals or actually adding them to the humidification system. The chemical manufacturer or distributor of the chemicals is responsible for transmitting with the initial shipment a material safety data sheet (MSDS) which provides information on the chemical and safe handling procedures, among other things. The receiving or downstream employer must make the sheets available to all employees working with these chemicals as part of his overall hazard communication program. Such employees who are or may be exposed in their workplace need the protections afforded by the information that must be provided to them in their workplace hazard communication program. 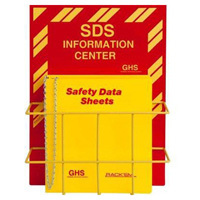 This CD has 25 pre-written safety plans that you can customize in minutes. Get yours from Safety Emporium. However, employees such as office workers who may be incidentally exposed to the chemicals in trace amounts from the humidification system would not be covered under the provisions of the HCS. These workers' exposures would be the same as the general public or other people in the building. According to the preamble to the final Hazard Communication Standard (Federal Register, Vol. 52, No. 163, August 24, 1987, pg. 31862), "...to the extent that workers are exposed to the substances in a manner similar to that of the general public, there is no need for any HCS requirements." We hope this discussion and enclosed information will be helpful to you in clarifying the issues you raised. Please feel free to contact us again if we can be of further assistance. We would appreciate your opinion on a matter regarding the OSHA Hazard Communication Standard. Several articles have appeared in a trade journal which discuss chemical use in humidification systems and requirements under the OSHA Hazard Communication Standard. A copy of one of them is attached for your review. Please note that it discusses retaining a legal firm, contracting with an environmental consulting engineer, environmental impact statements, submitting a plan to OSHA for approval, etc. With respect to chemical exposure from these humidification systems, attached is a publication which documents that room concentrations of amines were in the low parts per billion range when steam from chemically treated boilers was used for humidification. These air concentration levels are consistent with other studies and calculations using typical chemical treatment levels. Assuming that a room being humidified is a work area (e.g., office space), and given the typical levels of amines in the room air (ppb range), what are the requirements under the OSHA Hazard Communication for an employer? Also, are each of the nine items listed as suggested scope of work in the Engineered Systems article, consistent with the OSHA Hazard Communication Standard? Your opinion on this matter would be greatly appreciated. if you have any questions, or need additional information, please contact me in Horsham, Pennsylvania at (215) 674-9200. In an issue of its newsletter Facilities Forum, the American Institute of Plant Engineers Foundation provided some advice for owners of steam humidification systems. Retain a legal firm to advise on OSHAs HCS (Hazard Communication Standard) environmental requirements regarding hvac humidifiers used by the company to which any suspect or hazardous chemicals identified by MSDS (Material Safety Data Sheet) have been added. Contract with a consulting engineer to make an environmental impact study of any humidifiers that are currently in use which are chemicallly dependent. Obtain in writing an environmental impact statement (specific to HCS) from the company's present suppliers of chemicals and chemical services for chemically dependent humidification equipment. Have the legal firm summarize the engineer's and the chemical suppliers reports. Have the attorney write to the regional OSHA office asking for guidance with respect to the OSHA HCS requirements for your summary of the specific chemicals concerned. During the interval in which your company is waiting for answers to specific questions, you are virtually immune to OSHA prosecution, according to CFSI. Discuss the attorney's final recommended HCS disclosures with your company's insurance executives. The final HCS report to any employees exposed to chemicals should reflect the position of your company's insurers. Make the appropriate HCS disclosures to the employees. Make a long-term plan to become independent of chemicals by up grading or abandoning chemically dependent humidifiers. Have your attorneys submit in writing your long term plan to the regional OSHA agency, requesting approval of the plan and a request for notice. A written description of the humidifiers and humidification network currently in use at the premises. A written description of the procedures and equipment that adds chemicals to the humidifiers/support systems, i.e., boilers, boiler feed systems, sumps, sprayers, injectors, etc. Current chemical supplier MSDS cautions and descriptives regarding any hazards associated with the chemicals furnished for use with the above listed systems and equipment. An annual total of chemicals sold and used by the facility, month-by-month as purchased, or if possible, as used. A probable determination of: (a) how much of those chemicals are broadcast into workplaces by the humidification process; (b) annual exposure dose of each humidifier-broadcast MSDS-listed chemical as might be absorbed by any employee while in their workplace; and (c) workplace-weighted average chemical exposure levels compared with the THV permissible exposure levels for each MSDS chemical related to the humidification system. A recommendation for reducing chemical dependence of the present humidifiers, or for substituting chemicals having less hazard potential than those in current use. For more information contact CFSI Environmental Services, Dorchester Dr., Rye Brook, NY 10573; 914-939-4039.